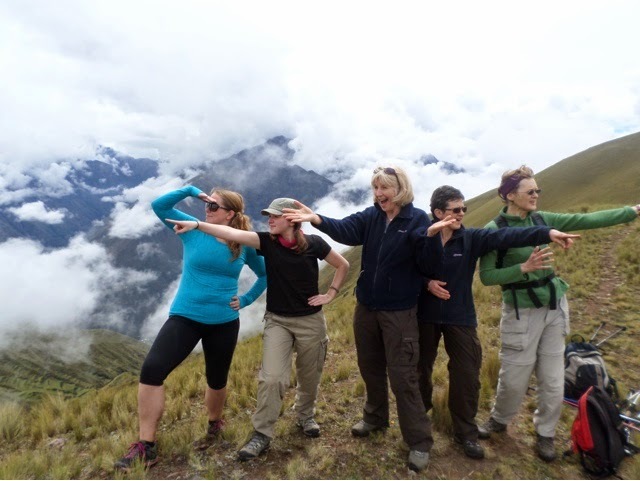 As part of our tour we visit Machu Picchu and usually the group hikes the Inca Trail to get there. The numbers are strictly controlled on the Inca Trail and everyone has to apply for permits months in advance, I had to get my passport renewed through the international passport authority and missed out on a permit. However I was able to take the road less followed and do the Quarry Trail instead, which I think turned out to be the better option anyway! 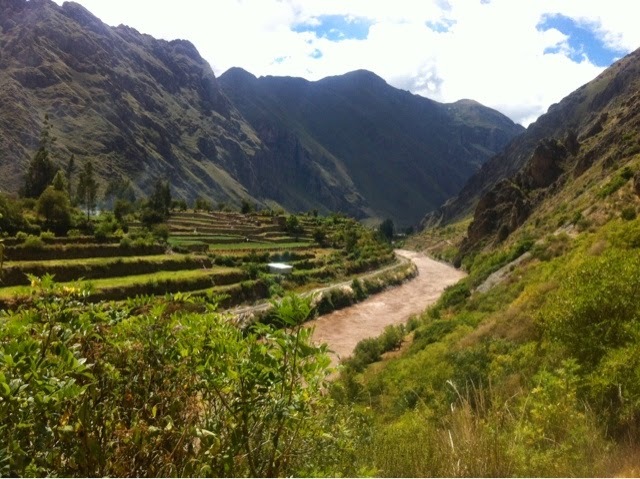 The quarry trail is a 28km hike around the sacred valley. 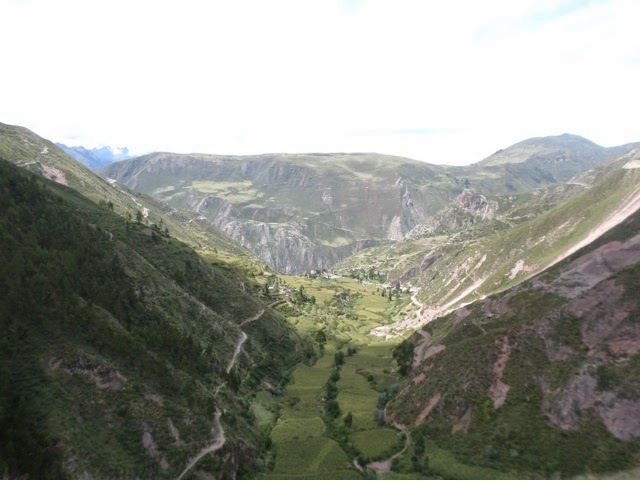 It starts an altitude of 2850m, around the same as Ollantaytambo, works up to 4450m and then comes back down to 2800m finishing back in the town. 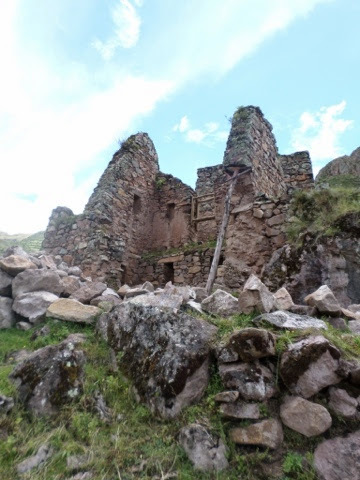 The walk takes 2 1/2 days with time to explore ruins on the way and the idea is to head to Machu Picchu town by train on the third afternoon, so we can head up to Machu Picchu early on the fourth day to meet the other trekkers and do our tour of the site. As I am the only person from my group doing the quarry trail I am joining with four women from another intrepid group. The trek started with an early pick up at 7:30 and I got to meet my new group, for the next few days at least. They are four British women. 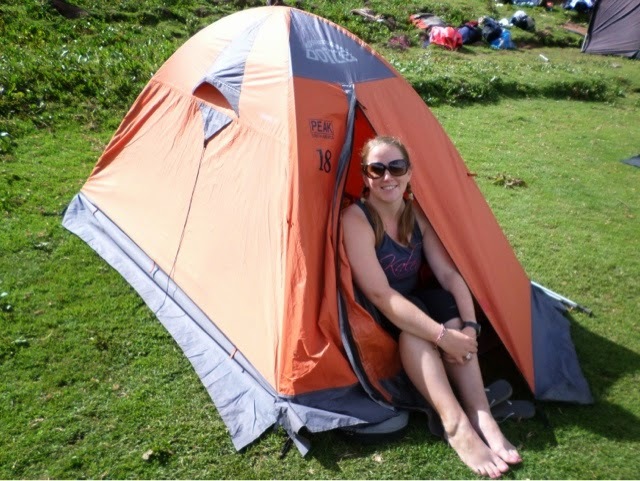 Alice, 28 is a primary school teacher who is currently working out in Peru as a voluntary teacher and doing work with local children. She is joined by her mum, Lynne and aunt, Sian. The four member of the group is Shauna, who is Lynne’s work colleague. Shauna and Lynne both work at a nursery together, Sian is a pharmacist. It’s funny that of all the places in the world the members of my group all live very close to the South East London suburb I lived in, Sydenham. Small world! It was also strange to be in an all British group. We drove out of Ollantaytambo for around forty minutes to our starting point, a place called Rafq’a, located at an elevation of 2850m. We met our crew here, Miguel the tour guide is 32 and from Cuzco. He is recently married a girl who works in bank in town. He used to work the Inca Trail and Quarry Trail almost weekly in high season, but now he limits it to once or twice a month, mainly working as a city tour guide. The rest of the group was made up of our two horse handlers and their five horses, with two small foals. Their names are Cecil and Aureal, they are both farmers who live in e local village communities we work through and they work the trail route when they aren’t needed to work on their land. 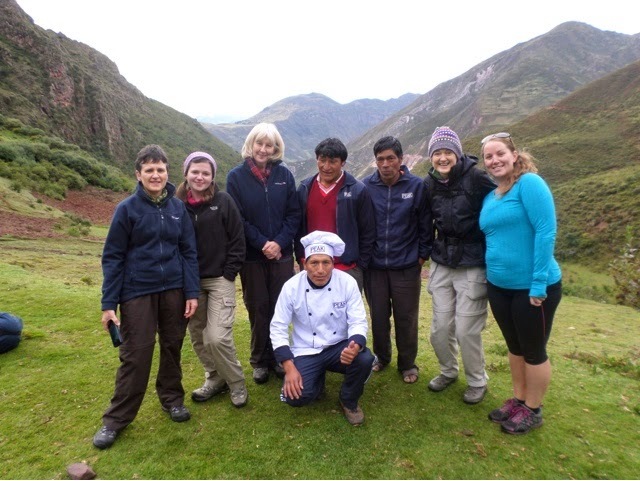 Finally we have our chef, Esteban who is from a community I’m the Sacred Valley, he started out as a porter on the Inca Trail and worked his way up to assistant chef and then to head chef. So a total of nine people and seven horses…. We started out uphill from the get go and walked until around 1pm. It was pretty hard going as the track isn’t maintained and is quite rough and gravelly. We stopped every 15-30 minutes to get our breath as you can really feel your lungs burning from the altitude. It’s a very odd sensation to feel yourself struggling to breathe without any of the associated muscle tiredness from exercising. We were given lots of sugary snacks to keep us going too. The walk wasn’t too hard, despite the incline. We walked up through a long narrow valley and e views were lovely. We passed through a small village and saw a local primary school, the school here only goes to primary level, at elementary level the children have a two hour walk into town! 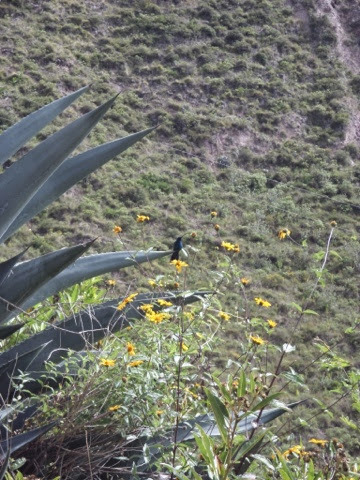 For a section of the walk we also had a hummingbird following alongside us, which was very pretty. There were lots of amazing flowers and fields full of maize. The whole valley base seems to be growing maize. There are also terraces which are cultivated almost the full height of the hillsides which I think are largely growing beans and potatoes. We stopped at a great view point halfway through our mornings walk, which is built out from the hillside and looks back down across the valley which we walked up. We followed the track running along the right side of the valley. Looking the other way from the view point, up the valley, you can see a huge waterfall and The first set of Incan ruins, which is close to our first campsite location. We walked up to the ruins which are located on the top of the hill above the waterfall and are called Perolniyoc. We stopped to admire the views and take a look around. A lot of it is falling down and is propped up, at least it’s not been reconstructed like most ruins seem to be in Peru! 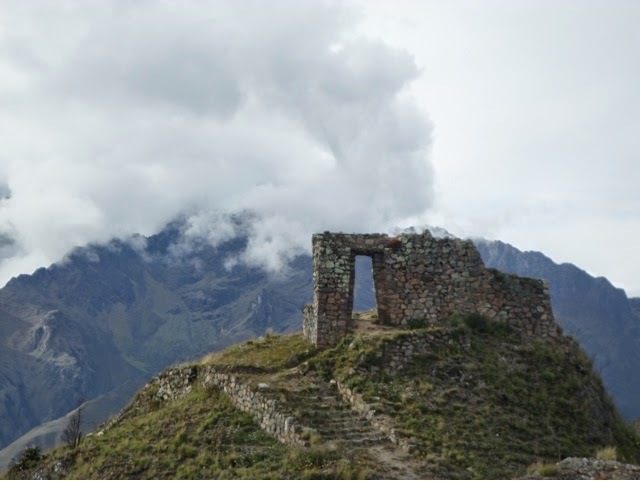 Our guide told us that it was built as a Tembo, or resting place, along a historical Incan trial. 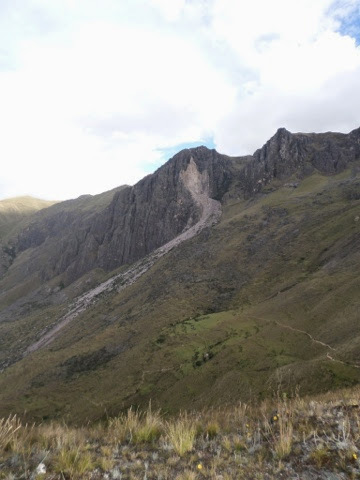 You can still see the trail running up the hillside and locals still use it to get to Ollantaytambo. The site would also have been used by travellers to collect supplies and for administration of the valley. Myself and Alice also practiced our Quechan with an attempted conversation with a local women at the site. From here we walked past a ranger station Q’orimarca, where we saw rangers drinking Chi Cha and resting their horses. It was only another 500m to our campsite. View of the waterfall, the ruins are located on top of the hill. You can see e track we took running about halfway up the side of the photo. Looking up at the ruins, which are in quite poor condition. Our guide also told us a lot about the trees and pallets which we walked last, which Sian was particularly interested in. We saw a lot of eucalyptus trees, introduced by the Spanish from Australia. They were introduced as they are very fast growing and produce strong wood with straight trunks. The wood is mainly used as a building material but local people also use the oil and the leaves. However, they are not popular with the farmers as they affect the quality and yield of crops due to their high water demand and they are considered and invasive pest. We also came across two different types of mint, which are found at different altitudes. The lower one has wider leaves and smells a bit like menthol. The higher variety, which grows above 4000m smells a bit like spearmint. 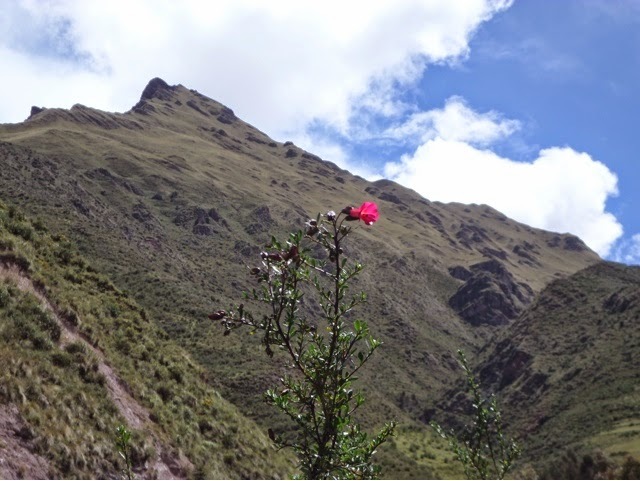 We saw lots of bushes of Peru’s national flower, a fuchsia, which they call something similar sounding to Qachan, although that’s probably horribly wrong! They’re very pretty though and brilliant pink in colour. On our first day we walked about 7km, an easy day to ease us in. After arriving at camp, which the guys had already set up for us we were treated to lunch. 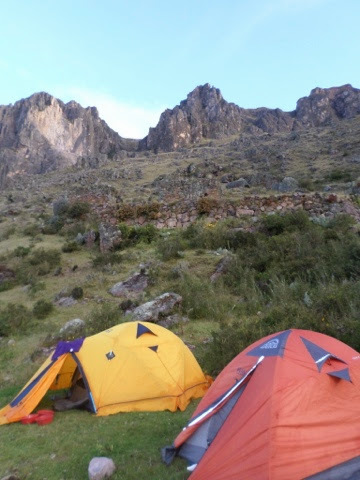 The campsite was at 3700m, so we climbed 850m in the morning, which felt pretty good going. Lunch was a three course feast, we started win an entre of guacamole and wontons, or rather large triangular corn chips. This was followed by asparagus soup and then baked chicken with veggies. We had non-alcoholic red Chi Cha and coca tea to drink, I think I am actually going to miss coca tea when we leave, it’s like a slightly nicer version of nettle tea and I really like it, especially when you throw a bit of fresh mint in too. We did get warned we would get fatter doing our trek rather than lose weight and I can see why! It was amazing that Esteban created such a great meal in his little kitchen tent, obviously very talented. It was interesting talking to Sian about dietary supplements too, apparently I should be taking selenium to assist with absorption of my thyroxin tablets and avoiding taking fish oils until later in the day as many of them are naturally high in vitamin e.
Miguel (backed up rather too enthusiastically by the rest of the group) has decided that this means I have to stay in Peru and marry Esteban the chef! Me in my digs for the next few nights, I had great views looking out over the ruins and down across the valley. It was such a hot sunny day we were all lucky not to have gotten burnt. The afternoon was spent chilling out and exploring nearby. I also tried to catch up on some diary writing, which I have been getting pretty lax at. Cecil’s village is located closely and some local women arrived, we assume one was his wife and she brought a baby along too. When it started getting cold we headed into the dining tent for afternoon tea and Miguel introduced the others to the art of playing shithead. Day two started out with coca tea in our tents and then Quinoa porridge for breakfast, followed by huevos rancheros. The altitude is making me lose my appetite, but you have to force it down or you know you’ll feel worse later and have no energy, despite all the snacks! Fortified by the huge brekkie and yet more snacks we headed off, aware that the second day was the “big one” and the first few hours were going to be rough. We walked for around three hours, solidly uphill from 3700m to the first pass which is located at 4400m. Along the way we passed through tiny villages, only 3-4 houses and gave some snacks and sweets to the local children. People were feeling the effects of the altitude more today, Lynne especially had a bad headache so we all just went at our own pace. I was quite lucky and hit my ‘zone’ and powered through a lot of the morning, albeit it powering quite slowly! It was amazing that as I was slightly ahead I reached the summit first and actually had a 360 view of the Andes completely uninterrupted by a single human being or building, it was mind blowing. I have always felt more at home in the mountains and I think you feel very close to nature here. I have pretty much lost the words to describe how the magnitude of the landscape makes me feel. I love it here on a very deep level. You can’t help but be in awe of your surroundings all the time and no words or pictures can compare to the feeling of being on top of the world seemingly alone. Celebrating reaching the first pass. If you look carefully you can see our lunch tents and the pack horses, we had great views down across the valley. Bizarrely I had said I was craving Lomo Saltado for lunch and lo and behold or appeared on my plate! This is getting funny! So much yummy food again, it was good to refuel though after a tough morning, I had rediscovered my appetite part way through the morning and completely demolished my snacks! The afternoon was spent walking amongst rolling hills over to the second pass, which is at 4400m, so still a bit more of a climb. The hills up there are red and there were lots of landslides and sink holes everywhere, it was pretty cool. Also, although Itchu grass grows everywhere up here they don’t have llamas or alpacas which seems odd… Potential business opportunity? At the second lass we were hoping to see condors, although we were there at completely the wrong time of day. We then spent several hours scrambling down the side of a large rockslide, which was physically and mentally draining. I have never been so glad of walking poles, I don’t think you could do it without them. It was actually so steep and loose underfoot that when the horses came past to overtake the horse drivers were having to force the horses down. From the bottom of the scree slope we headed over to the sun gate, although it’s not actually a sun gate as the gate is actually aligned to the mountain Apu Veronica, Waqay Wilca, which was hiding from us behind the clouds. You can hardly see that the sun gate is even fee unless it’s pointed out to you and it makes it feel like a special secret place. 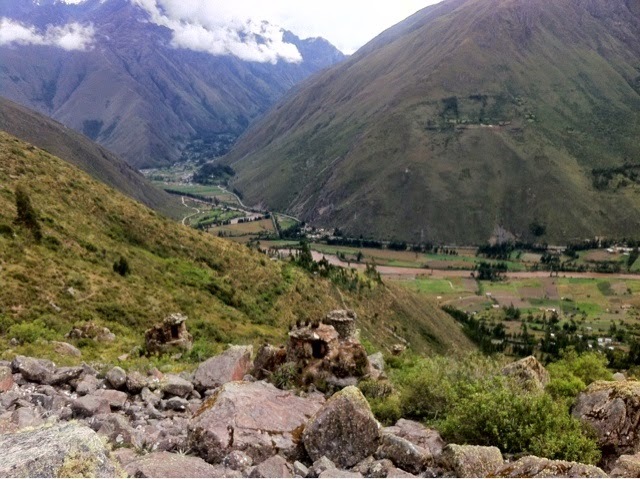 From here you had 360 views of the sacred valley across to Ollantaytambo and beyond. The snow-capped mountains just seemed to go on forever. 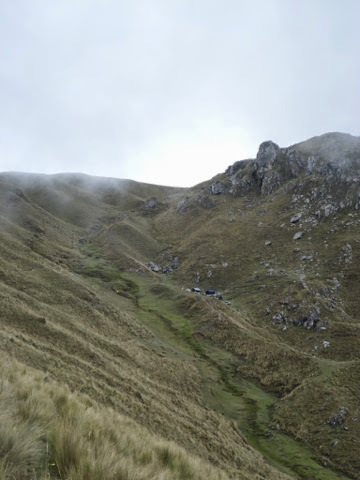 We then headed downhill to 3750m to our campsite, which was located in the midst of Incan ruins, Coquetacarpo. View of scree slope, if you look closely you can see a tiny yellow dot which is our campsite! We climbed down the right hand side of the rockslide where the dip in the skyline appears. View upslope from the tents, you can see where we climbed down from the second pass. That evening Veronica revealed herself in stunning style and we were lucky not to miss it. That afternoon I was treated to my first British Cadburys chocolate in years and Alice had brought some to afternoon tea. We also had hot chocolate and apple filled wontons which were crazy tasty. Lo and behold my coveted bowl of spaghetti appeared before me… So I guess I am now engaged to our chef! We also had pancakes for desert and he was very sweet and drew a heart on mine in caramel! Who would have guessed I would find a chef in Peru with a psychic connection to my stomach! Our final day (sad) started out with another huge breakfast, this time with the totally amazing chocolate quinoa porridge! We packed up and left camp after saying goodbye to the staff except for Miguel. Esteban gave me his chef’s hat… Apparently according to Miguel this counts as an engagement ring ha ha! I was also told that In his community you have to wear red to your wedding…. The guys are planning it already… Who knows hey! The walk was mainly downhill that morning and crossed the large rockslide from the previous day. 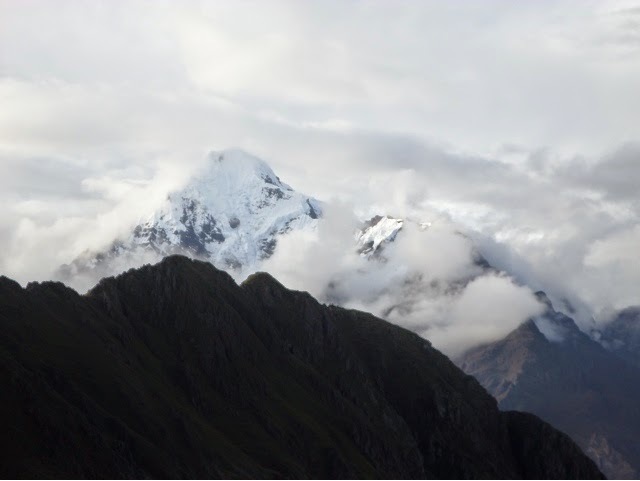 The day had started with a huge whiteout but it lifted and became very hot and sunny and we had great views across the entire sacred valley. We stopped at a quarry and then again lower down we had another stop, where there were more partially quarried blocks. At the first, main quarry there were lots of semi quarried blocks or pink granite, they worked the stone using haematite which is stronger than the granite. They then pulled it downhill and over to the town using llama skin ropes and balls of stone to roll underneath. There was also a small cave, which was completely u protected and contains the remains of several mummies inside. Apparently it was only found in recent years by a local shepherd. The pottery from the cave was removed by ranger and the mummies left behind. It was bizarre as this sort of thing would be so heavily protected at home, but here it’s just been left. Miguel also explained that the mummies were the bodies of sacrificed individuals. At the start of each new large project the town would sacrifice a person, usually a girl with unusual characteristics, such as albinism. Apparently it was a highly prized honour and parents actively wanted their children to be sacrificed as it meant that they would be with the gods in eternity. The girls were prepared by local shaman who would then poise. Them and kill them by hitting them over the head with a large rock. They would then be mummified and placed in the cave. At the second quarry stop we saw several small pre Incan structures there which are actually tombs and would have contained mummies too. At this stop Miguel explained that actually it’s a mistake to call the culture Incan as in actual fact the term Inca refers only to The Lord or king and the name of the community or culture is actually Quechan or Andean. 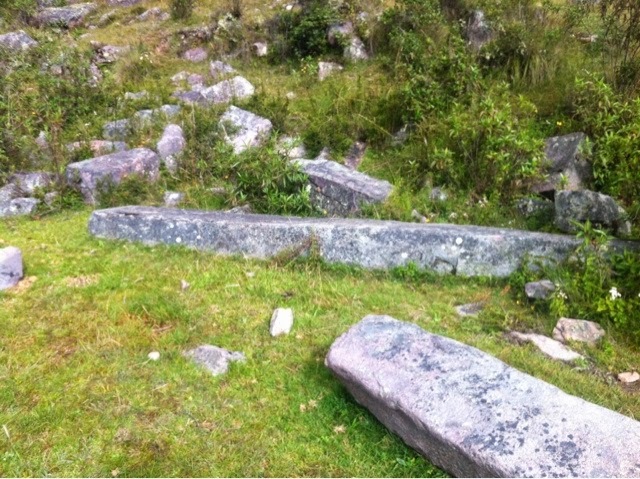 Partially hewn blocks of pink granite. The walk back into town was along a small track and we gradually saw ollantaytambo coming into sight, we crossed the town bridge which marked the official end of the trek and then we had to walk up a bunch of stone step back into town. My right knee went somewhere down the hill, the back of it just felt like it snapped and so that has been interesting. Overall we climbed and descended 1600m! Whoa! It was certainly a challenge but it felt great to have done it. I cannot believe that we were fortunate enough not to see a single other group of tourist and hardly even any locals of our trek. It was like our very own little slice of the Andes and it was very special. From the town it was totally crazy looking back up the hill and seeing where we came from! It was such a great time and I am so thankful to have had such a brilliant group, a really great group of strong and inspirational women. I had some really great conversations with Sian in particular which have really helped me to clarify what I want in my own life which I have been puzzling over for the last year. It certainly feels good to have a semi plan again and to have least identified some exciting new personal goals. It was also great to feel like part of their little family and they were so wonderfully warm and welcoming to me. It was so lovely to see the great close relationship Alice has with her mum and her aunt, although this also made me feel pretty upset thinking about personal loss of the people closest to me in my own life over the last few years. Sian said she thought I seemed very well self-contained, which is funny seem as I think I am a great big emotional explosion which covers anyone who gets in the way! I guess you never know how other people see you until they tell you though. Miguel was a great guide and it was nice to be with someone who always calls us chicas again 🙂 which I had missed from Ecuador. I am now totally in love with Peru and think that I have been totally ruined for landscapes across the world now! Bizarrely I was also a bit sad not to be camping tonight and not to be eating my fiancés cooking anymore… I’m sure I will get over that pretty quickly though :-). Back in town we visited a local house. The floor was covered with guinea pigs and they had lots of desiccated animals on the wall, bit weird by western standards but interesting to visit. I would not want to live in house like that though. then it was time for a celebratory beer! The two tour guides and the people who had stayed in Cuzco came and met us in a cafe and then we headed to the train… And on to Machu Picchu! Argh exciting! 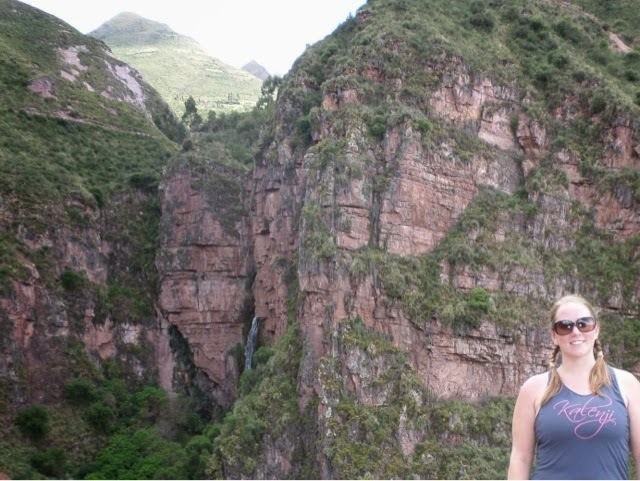 This entry was posted in Travel and tagged Andes, Apu Veronica, Camping, Chi Cha, Coquetacarpo, Hiking, Inca, Inca Trail, Intrepid, Machu Picchu, Mummy, Ollantaytambo, Perolniyoc, Peru, Qiorimarca, Quarry, Quarry Trail, Quecha, Quinoa, Rafq-a, Scared Valley, South America, SouthAmericanAdventure, Sun Gate, Tomb, Travel, Waqay Wilca. Bookmark the permalink.